On difficult streams like the Henry’s Fork, experienced anglers understand the perfect fly is useless if you can’t make a natural presentation to a feeding trout. Photo by James Nelson. Lee writes of a fishing friend, Ed Van Put, who uses only three patterns — the Adams, the Royal Wulff, and the Pheasant Tail Midge — and catches as many fish as anybody he knows. Gary LaFontaine, in The Dry Fly New Angles, defines anglers who tackle fly fishing with only a limited number of flies as generalists. “Presentation is everything,” the generalist insists. I must confess that Lee’s book really raised my hackles. 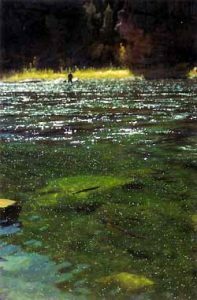 I can recall more than one angler who came to fish the Henry’s Fork with his true favorite fly pattern only to be thrashed by the ultra-selective trout. Nothing can be more frustrating for an angler than having your pattern completely ignored while trout feed leisurely all around you. It has happened to me many times, once when a big brown was sipping midges on the Big Spring in Pennsylvania. I finally hooked the fish, but not until I had gone through almost all of my midge pupa patterns. If you want to waste some time, try fishing to a fish like that for several hours stubbornly lock-stepped to the same fly. I’d like to meet the guy who could have caught that old boy on an Adams. The problem with some guys who got their butts kicked on the Henry’s Fork was that in their minds, it wasn’t the fly. I guess the only thing that gave me solace when I read Art Lee’s book was when he said, “No fly is right unless it’s fished correctly.” On that point I completely agree. Gary LaFontaine said that the three main methods of deciding on a particular fly areempiricism (trial and error tempered by previous experience), generalism (actually a denial that fly choice is very important), and naturalism (bug watching). Sometimes it is tempting to keep changing flies in an effort to catch selective trout, but you may lose focus on the importance of proper presentation. Photo by Jeff Currier. To a certain degree, all of us are empiricists. We have favorite streams that we fish as often as possible, and the experiences of the past influence the way we approach the water and the fly patterns we use. Vince Marinaro had his beloved Letort. I connected with him when I read A Modern Dry Fly Codebecause the Henry’s Fork was my Letort. There are, however, only a few streams that I can fish using the empirical approach. Experience doesn’t mean much on waters I don’t fish enough under the same conditions, but I do spend enough time fishing other waters to understand that I can catch fish if I use the naturalist approach — studying what the trout are feeding on and using a pattern to match. The best hatch-matching anglers do not change flies every twenty seconds. If they see fish feeding, they spend the necessary time to learn what the trout are eating before they ever tie on a fly. Once they know what the trout are feeding on, they know what fly to use. 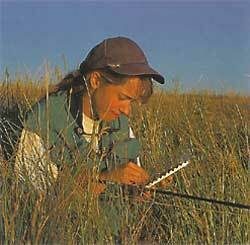 They use a very calculated approach; they are naturalists because they study the water and the insects to determine the feeding activity of the trout. They are empiricists because they know from experience what fly to use when a specific insect is on the water. Fishing a hatch of pale morning duns on the Henry’s Fork isn’t different from fishing the same hatch on Fall River in California or Nelson’s Spring Creek in Montana. The problem that results from the debate between the overenthusiastic hatch matchers and the practitioners who depend on precise presentation with a few dependable patterns is the focus that is placed solely on catching trout. Both methods will catch trout and, more importantly, bring satisfaction and enjoyment to the angler. If you match the hatch, you’ll learn to understand and appreciate the trout’s diet and aquatic environment. The study of trout food can provide a real challenge. On the other hand, tying on a fly of your own choosing, without regard to what the trout is feeding on, can bring its own reward. Doing it your way and hooking a tough trout can be a most satisfying experience. The best way to catch trout on spring creeks and get the most enjoyment from the experience is to be a generalist, an empiricist, and a naturalist. From the day that Alfred Ronalds published The Fly-Fisher’s Entomology in 1836, anglers have been fascinated with aquatic insects and the flies to match them, and although matching the hatch is the essence of fly fishing on spring creeks, it isn’t always the best or most effective approach. Sometimes matching the hatch can actually be counterproductive. I always keep a box filled with standard dry flies that don’t imitate anything in particular. My four favorites (from left to right) are Royal Wulff, Renegade, Parachute Adams, and Humpy. There is a place for generalism on spring creeks and tailwaters. For times when un-matching the hatch is the best way to catch trout, I carry a fly box filled with attractors and standard patterns that don’t imitate anything in particular. This is my most precious fly box filled with Royal Wulffs, Humpies, Adams, Parachute Adams, Stimulators, and other traditional dry flies from size 10 down through size 20, and I guard it with my life. Whenever I travel to distant waters, I make sure it goes too. My favorite time to use these patterns is when there isn’t anything else on the water, when visibility is too difficult to see other patterns, and when there are so many naturals on the water matching the hatch would be impossible. It was a typical September day on the Henry’s Fork. At 8:30 a.m., as I walked downstream through the grassy meadows, Trico spinners swarmed in a final mating dance, forming mist-like clouds along the stream bank. The fishing had been tough, as it usually is with Tricos. The feeding frenzy lasted about two hours until the last of the spinners had fallen. I had managed a couple of good trout using a size 22 quill-bodied pattern with spent hen hackle wings that matched the naturals almost perfectly. Later there were just enough Callibaetis spinners and mahogany duns to keep the trout interested. When there are just enough larger mayflies the fishing can be easy, and it was. It was a matter of getting close and making the proper presentation. I had my best success with a size 18 Mahogany Dun No-Hackle, but I think an Adams would have worked equally well. By midday the tiny Baetis mayflies started to emerge, and by early afternoon they blanketed the water. Early on I caught a couple of trout with an exact imitation, but eventually the surface was so densely covered with tiny mayflies that it looked like a scum on the water. It was time to change tactics. Early in the hatch, when there are only a few insects on the water, trout aren’t usually selective. Later, when they start to feed on the hatch, they can get tough. When they key on a certain stage of the hatch, they look carefully at each insect that drifts into their window of vision. The trout are likely to take almost every mayfly that comes by, but you better have the right pattern because you know the trout will take a very close look. 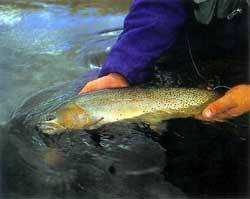 As the hatch intensifies, trout begin to settle into a steady feeding rhythm. When hatches are heavy, trout don’t need to focus on each individual insect. When the surface is carpeted with mayflies, trout conserve their energy by rising at calculated intervals, paying less attention to specific insects. Sometimes the mayflies are so prolific that trout gulp several insects with each rise. That’s when the fishing gets tough. 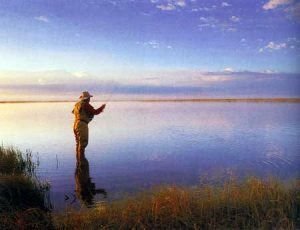 Even though you have precisely the right pattern, the trout isn’t likely to see it unless you get it to him at the exact time he is coming up to take his next fly. Timing is critical. Another problem is that the feeding zone narrows when more insects are on the water. During heavy hatches trout usually hold very close to the surface where their window of vision is narrow. Instinct dictates that there will always be insects to feed on no matter when trout rise, so they don’t move very far from their feeding lane to take a fly. That doesn’t mean the trout will hold in the same spot. In fact, one of the challenges you’ll encounter on spring creeks is that the trout will start to move around more as they feed. Couple their feeding rhythm with their cruising, and you’ve got a real problem. When the surface is covered with insects, you must do better than match the hatch to draw the trout’s attention to your fly. Photo by Larry Tullis. Now let’s throw some more fuel on the fire. If you are going to match a tiny fly exactly, so that the trout can’t tell the difference at a few inches, how are you going to identify your fly twenty-five feet away? In my early days, when my eyesight was sharp and honed, I could see my fly seventy-five percent of the time. 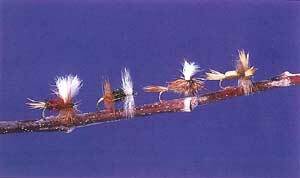 Twenty years ago I can remember guiding older fishermen and wondering why they couldn’t see a size 20 No-Hackle at only twenty feet. Today I can identify with them completely. Sometimes, about the only time I can see my fly is when it is dragging through the middle of all the naturals. When the surface is blanketed with tiny mayflies, matching the hatch perfectly can really be a handicap. You must do better than match the hatch. If there are forty-nine tiny mayflies per square foot of surface area, and you’ve matched the hatch perfectly, you’ve just created fifty mayflies per square foot of surface area. When trout really get into a feeding rhythm, they rarely rise more than once as two or three feet of water passes over them. That means they let dozens of naturals pass over them between each rise. It can take dozens of near-perfect casts before the trout sees your fly and decides to take it. I’ve seen anglers scratch their heads and change flies over and over again trying to get it right. In reality, the trout they were fishing for probably never even saw any of their flies. If the fly didn’t arrive at the precise moment in the trout’s feeding rhythm, it probably didn’t get noticed. If the fly was a proper imitation, chances are the angler didn’t see it more than half the time. If you can’t see your fly, not only can you not tell when a trout takes it, but you also can’t tell if it is drifting naturally or if it is in the trout’s feeding lane. In these kinds of situations, I’ve found a highly visible attractor pattern can work. In my experience, trout are not normally as selective to pattern when tiny insects blanket the surface. When they get into a tight feeding rhythm, they usually don’t scrutinize their food before they take it. If, when a trout starts to poke his nose up, there are ten naturals in the area, you might get better results if your fly looks different from the naturals. Not only is the fly easier for you to see, it is easier for the trout to see. Sometimes when the surface is covered with emerging insects, you’ll need to use an attractor pattern like a Royal Wulff to direct the trout’s attention to your fly. Illustration by Dave Hall. The secret is matching the trout’s feeding rhythm instead of matching the hatch. You’ve got to get close. If you slip in from behind, you can frequently get within ten or fifteen feet of a trout. At this range you don’t need to false-cast. Another good angle is to move in from the side, slightly upstream from the fish. There is no reason to waste casts in the air when the fish is in the water. You can get close enough to measure out the distance and lay each cast in almost exactly the same spot. Once you get the distance measured, you can start concentrating on timing your casts to match the trout’s feeding rhythm. My four favorite attractor patterns are a Royal Wulff, Renegade, Parachute Adams, and Humpy. I’ve found you can’t get away with using a much larger fly than the naturals. If the mayflies are size 20, your attractor should also be a size 20. Using a dry fly with a nymph or an emerger as a dropper is a very effective technique. It also works with another dry fly. If you find that trout are super selective and won’t take anything that doesn’t look like the naturals, you can tie a short section of leader from an attractor pattern and attach an imitation that matches the hatch more precisely. I use this technique a lot during the spring and autumn when the tiny blue-winged olives are on the water. I like to tie the dropper fly only about a foot from the attractor fly so I can better detect when a trout takes the dropper. There are some shallow flats on the section of the Henry’s Fork that flows through our pasture above St. Anthony. I don’t often get a chance to fish with my daughter, Jeanette. She is a fine caster and loves to fish, and we always try to schedule at least one day in June to fish the gray drake hatch together. There was a special day when the sun was bright and the big mayfly spinners danced over the water. Gray drake spinners often converge on the water so thick that if you match the hatch it can be impossible to see your fly amid the thousands of naturals on the water. We were both using parachute patterns, but the trout we hooked were few and far between. I eventually tied a size 12 Gray Drake Spinner as a dropper about a foot below the upper fly. The change in pattern brought quick results, and we immediately started catching fish. We worked up on the pods of fish from below, taking turns casting to the rising trout. We had each hooked a number of nice rainbows when the water boiled on Jeanette’s Parachute Adams in a riseform that spelled a big fish. She hooked the fish solidly, and it sped downstream. When she was finally able to move it into quiet shallow water, I could see the brilliant golden flanks of a big male brown with bright buttery yellow flanks at least twenty inches long. The trout had taken the upper fly. There was little doubt in my mind that the big trout didn’t want an exact gray drake spinner imitation. But he couldn’t resist the Parachute Adams. It was just different enough to draw his attention. Skating Spiders, when fished correctly, can produce smashing strikes. In the early 1970s I read an article by Joe Brooks in Outdoor Life about Skating Spiders. Edward Ringwood Hewitt had originated the pattern and the technique to fish it on his home water, the Neversink River in upstate New York. Hewitt was cantankerous and secretive about the details of the pattern and the method of presentation. The fly was tied on an extra-short-shank hook with stiff hackle at least three times the normal size. There was no tail or body, only hackle. The front hackles were tied with the dull side toward the back of the hook and the back hackles facing forward so that the tips of the hackles met in the middle of the short hook. Joe Brooks’s description of the fly and the method to fish it were both intriguing and enlightening. He included a couple of photos of Skating Spiders that I used as examples to tie up a few patterns. The technique was to twitch the fly so it would skate and jump across the surface of the water. I had trouble making the fly work properly until I realized that I had to grease the entire leader. If the leader sinks below the surface, twitching the fly will only pull it against the surface. I later realized that the skating method works best on a fairly stiff tippet. I’ll never forget the first trout that charged after one of my Skating Spiders. He tore after the fly with a slashing strike. I pulled the fly away from him, but he came after it again. When he finally grabbed it, I struck so hard that I left the fly in the fish. I tied on another spider, and it moved another trout. The technique was a lot like fishing a streamer on the surface. If I could get the right action, the trout charged and slashed at the fly, often knocking it out of the water. The trick was to let the fly land on the water, let it drift a short distance, and then give the line a quick twitch, which made the fly jump across the surface on the tips of the hackle. To a trout, movement means life. The fish really aren’t looking closely at the fly. It’s the movement that triggers their instinct to attack. I later read Ernest Schwiebert’s similar account of fishing Hewitt skaters with Charles Fox on the Letort. To give the Skating Spider the proper action to entice slashing strikes, you must grease the leader and twitch the fly with a tight line by lifting the rod. Illustration by Dave Hall. Schwiebert also pointed out that skaters work best when the trout are accustomed to seeing an occasional big insect fluttering across the current. Skaters gained popularity on limestone streams as good imitations of the eastern green drake. In The Dry Fly: New Angles, Gary LaFontaine also notes the effectiveness of skating spiders when adult craneflies skitter and dance on soft-flowing currents. 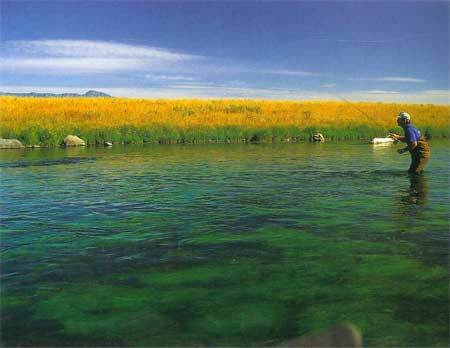 He states that in late summer, on streams like Montana’s Beaverhead or upper Clark’s Fork, the water over the flats at dawn appeared to have an “orange haze” from the flitting cranefly adults. In this case, he used the brown and orange hackle skater to mimic the adult craneflies. Today Skating Spiders are not commonly used on spring-creek waters. 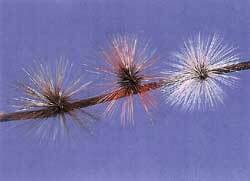 The large, stiff hackle used in tying them is hard to find. I’m not aware of any commercial fly-tying businesses that offer them, and it is almost impossible to find a good Skating Spider in any fly shop. I tie them on a size 14 hook with hackle suited to a size 6 or larger if I can find it. If you enjoy trying something different, and you enjoy tying your own flies, give Skating Spiders a try. Trout also can become very selective when there aren’t many naturals on the water. I’ve noticed this more on warm summer days when the mayfly duns fly almost immediately from the surface as they escape the nymphal shuck. There are usually many more mayflies emerging than you think because they don’t stay on the surface long. To fool selective trout, you may want to use a terrestrial, even if you know they are feeding on aquatic insects. In this situation trout are much more likely to focus on emergers and cripples in the surface film. Even though there are several excellent patterns to imitate this stage of the hatch, it’s difficult to take trout under these conditions because the naturals wiggle and squirm as they try to escape the nymphal shuck. I can tie imitations that look right, but they don’t wiggle and squirm enough to look like the naturals. This can really be a frustrating experience because sometimes you can see the trout sliding back and forth just under the surface feeding steadily but never taking a dun. Even the best anglers only take an occasional trout when they get this selective. When trout are selective and there are a lot of mayflies or other aquatic insects on the water, I like to switch to a terrestrial. Even though trout see heavy concentrations of the same species of mayfly at specific periods, there are beetles, ants, crickets, and other terrestrial insects drifting in the currents throughout the day for months on end. By midsummer, the trout have become conditioned to seeing these terrestrial insects. Trout look for positives, not negatives. They see so many terrestrial insects throughout the season that they instinctively respond when they see one. These types of food forms are soon imprinted on their tiny brains, sort of like a secondary selectivity which will likely cause a positive response no matter what else is on the water. Trout really seem to show a taste preference for them. You’ll do better if you use a terrestrial pattern that resembles the insects most common to the waters you’re fishing. Even though you don’t usually see a lot of ants or beetles on the water, if you take a few minutes and seine the surface film, you will usually pick up a few terrestrial insects. Ken Miyata gained well-deserved praise for an article called “Anting the Hatch,” in which he pointed out that trout have a distinct preference for ants. Ken didn’t waste time trying to match the hatch when the trout started to get selective on mayflies or other aquatic insects. Instead, he tied on a size 16 flying ant pattern, totally ignoring what the trout were actually feeding on, and he caught fish. I fished with Ken often. He was a fine angler with the skills to take matching the hatch with dry flies to its highest level. However, there were times when he wanted to set his own fishing standards instead of trying to duplicate the presentation of a tiny insect to a feeding trout. This fat Wyoming cutthroat took a beetle imitation when the surface of the water was covered with pale morning dun mayflies. Photo by Jeff Currier. I’ve said before that if I only had one dry fly that I could take anywhere in the world, it would be a black beetle. It is surprising how easy it is to see a black beetle or ant on the surface, but I also tie some of my small terrestrials with a tiny bright yarn indicator on the top of the fly. It doesn’t seem to bother the trout, and it makes seeing the fly a lot easier. It is important to remember that a trout is a primitive creature, possessing little more intelligence than the insects he feeds on, but his senses are superb. He survives on instinct. His vision is so keen and his feeding so exact that we can never fully achieve the perfect deception. No matter how precise my imitation, I cannot be assured a trout actually took it for what I intended it to be. During the years I traveled with Gary LaFontaine, we had fun arguing. Like many anglers, he wanted to have an answer for everything. He tied many crude patterns and had reasons for why trout took each of them. He compiled all his research and patterns in Trout Flies: Proven Patterns. I enjoyed teasing him about why each of his crazy patterns worked. His scientific approach to everything is what made fishing fun for him. It is human nature to be presented with an intricate problem and find a solution, and unraveling the complexities of a hatch gives fly fishers much satisfaction. There is a lot to learn, and it would take more than a lifetime to learn it. It isn’t new. Fly fishers have been trying to solve the mysteries for centuries. But for me, sometimes I don’t want to think about why trout do anything. I have enough to worry about just keeping my tackle organized and remembering where I left my car keys. It is enough just to watch a trout rise to take my fly. Whenever possible, I like to use patterns that imitate as closely as possible the food the trout are feeding on. Matching the hatch is my kind of game, and I like to play it whenever I can. There are times, however, when it just isn’t practical to match the hatch. Trout will thumb their noses at even the most experienced angler. Sometimes the best way to deal with such a simple creature is to simplify your tactics. That’s when you need to convince the trout to play your game.